Figure 2. Calipari et al., Nature Communications, 2013. Our work has aimed at outlining how stimulant effects at the dopamine transporter influence the motivational properties of these drugs of abuse. By combining voltammetry with drug self-administration (for amphetamine, methylphenidate, cocaine, and methamphetamine) we have aimed to determine the effects of chronic drug exposure on stimulant effects on the dopamine system and how these influence motivation. Further, by using compounds with different structures and functions we are able to understand the precise changes that occur at the level of the dopamine transporter to influence drug action. Although both males and females become addicted to cocaine, females transition to addiction faster and experience greater difficulties remaining abstinent. 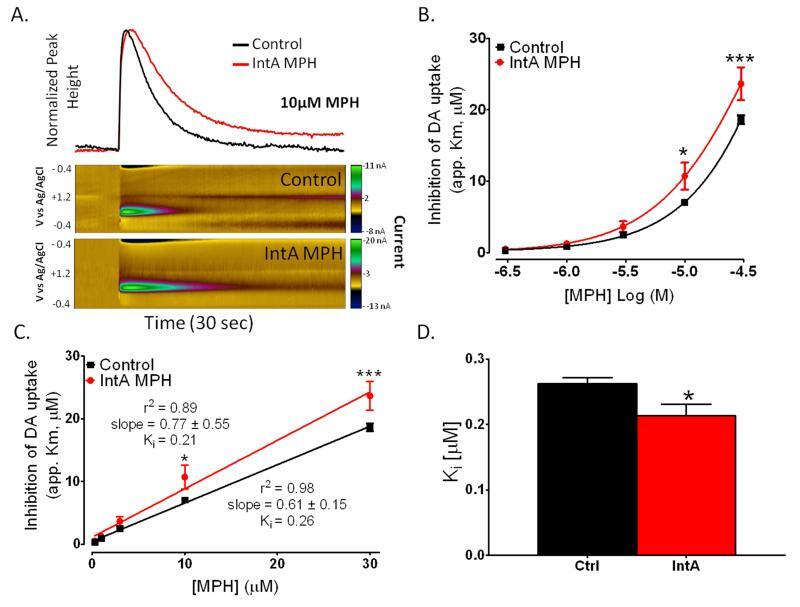 Our recent work has shown estrous cycle-dependent fluctuations in both dopamine system function and cocaine actions directly at the dopamine transporter. Cocaine actions at the dopamine transporter are critical for the reinforcing and rewarding properties of the compound, thus this work aims to understand the molecular mechanism by female vulnerability to cocaine addiction occurs.